Ok, let's just address the elephant in the room (OMG I WISH THERE WAS AN ELEPHANT IN MY ROOM!...sorry...I love elephants...off topic...): I know. 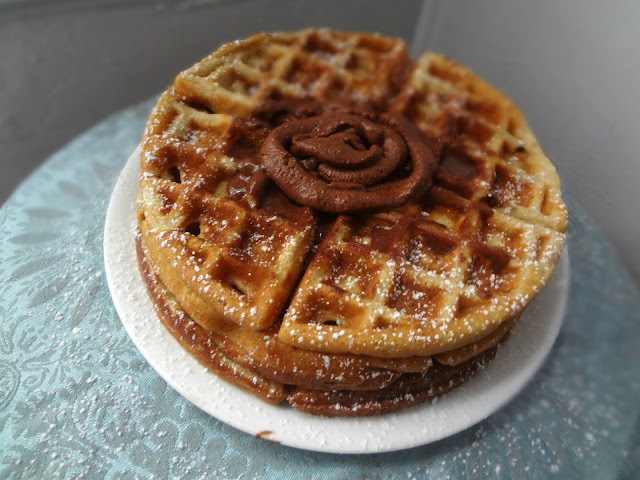 That whipped cream on top of those waffles...*sigh of embarassment* looks like a poop. UGH! I'm sorry! I just...I didn't mean for this to happen, but it did. This teaches me the lesson that I need to get myself a piping tip . Ugh. Ok, anyway, now that we've talked about it, let's just try to forget about it and move on, ok? Ok, great. Thanks for being so mature about this. Anyway, I've been lusting after The Cookie Dough Lover's Cookbook for quite some time now. And, thanks to the AMAZINGESS of one of my newer bloggy buds Zainab (AKA Blahnik Baker) I now am in possession of my very own copy! EEE! One of the very first things I made from my beautiful new cookbook was these cookie dough waffles. But um...even though they are clearly not a healthy brekky, I still attempted to make them a little less inappropriate for morning times. Essentially I used some whole wheat flour and subbed in STAR'S new Butter Flavored Olive Oil (more on that in Friday's post) in for the butter in the waffles. 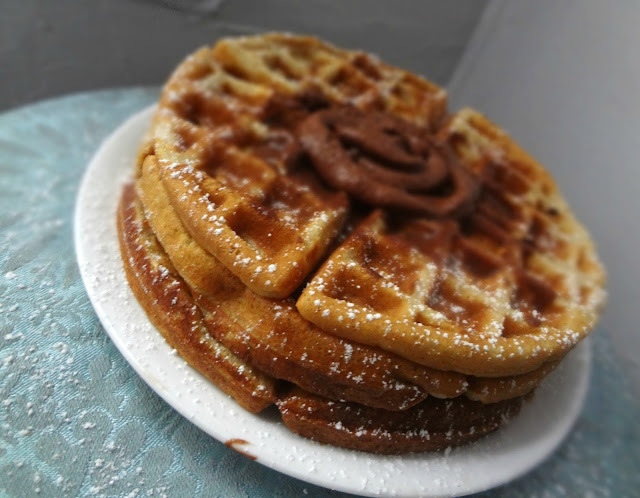 Super easy swaps and I still ended up with amazing waffles that were chewy and deliciouuus! Now...these waffles were yummy. Don't get me wrong. But....the cookie dough was sort of barely present, I assume since the dough got all cooked in the waffle iron. Plus this makes A LOT of waffles. So, unless you have a small army (or ya know...a family) to feed, maybe decrease the recipe. But I gotta say, this is a DEFINITE show stopper. 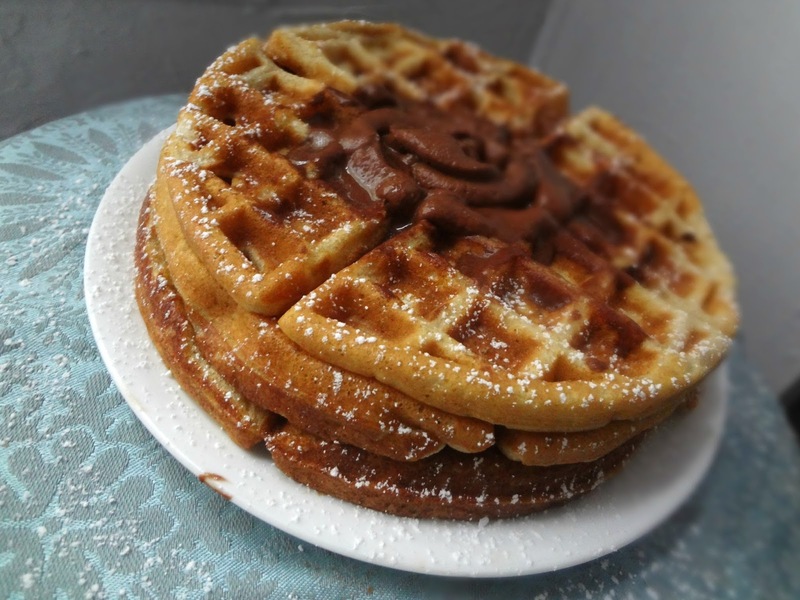 Nothing like tellin' people "Oh hey, I made cookie dough waffles topped with some chocolate whipped cream..." Yeah...I can practically see the drool already. Note-You can use a regular waffle maker, the amount will just vary. Using an electric mixer on medium speed, beat together butter and sugars until light and fluffy (2-3 minutes). Beat in vanilla and milk/cream. Mix in salt and flour. Refrigerate until ready to cook the waffles. Whisk together flours, baking powder, baking soda, and salt. In a larger bowl, lightly whisk eggs. Then mix in buttermilk, butter olive oil (or melted butter), sugar, and vanilla. Preheat waffle maker and generously grease (with cooking spray or oil, etc.--I had a lot of issues with sticking, so be thorough). 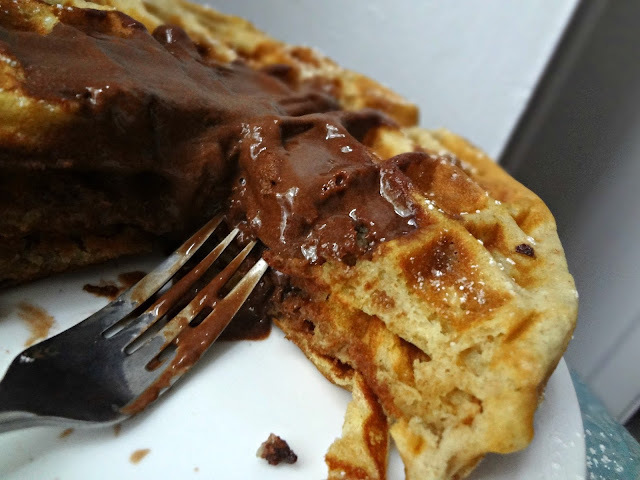 Drop a heaping 1/2 cup of batter onto the waffle iron and quickly drop 6-7 marble sized balls of cookie dough on top. Close lid and cook according to directions, until golden brown and toasted. Whisk together 2 tbsp. heavy cream with the powdered sugar, cornstarch, and cocoa powder. You can freeze leftover waffles in a freezer bag for up to 1 month. Reheat in an oven or toaster oven. Disclaimer: I was provided with product from STAR Fine Foods to try, but I was under no obligation to review if I so chose. Nor was I under any obligation to write a positive review in return for the free product. My opinions, as always, are all my own. This post contains Affiliate links.